Digitalization, financialization, globalization and consolidation are major trends under way within global media industries. Drawing upon empirical evidence from across media sectors and geographical boundaries, this book examines the impact of these ongoing trends on media production, distribution and characteristics of media products, and attempts to debunk a series of global media myths. The book covers lots of new ground but Bingchun Meng was left wondering why Asia did not feature more prominently in a book on the transformation of global media. Political Economies of the Media: The Transformation of the Global Media. Dwayne Winseck and Dal Yong Jin. Bloomsbury Academic. 272 pages. July 2011. 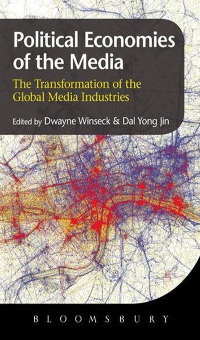 This volume edited by Dwayne Winseck and Dal Yong Jin is a timely intervention in key debates on the transformation of global media industries. The collection directly engages with major theoretical issues for analyzing the institutional arrangements of media in changing global contexts. While anchored in the critical tradition of political economic inquiry, the contributors to this volume also draw upon a diverse range of thoughts including neoclassical economics, radical media political economy, Schumpeterian institutional political economy, economic geography and network theory. The diversity of perspectives leads to the recognition of multiple sites of struggle and flux, rather than the monolithic view that assumes the determining force of a single institutional logic. Among the major trends in media industries that the book has identified are digitalization, financialization, globalization and consolidation. Drawing upon empirical evidence from across media sectors and geographical boundaries, the authors examine the impact of these ongoing trends on media production, distribution and characteristics of media products. But more importantly, the book sets out to debunk a series of myths that have been widely circulating in both academic and popular discourses on recent changes of global media. Here I will just mention two myths about digitalization. First the interactivity and decentralizing nature of digital networks are often celebrated as the trigger of participatory communication. Several contributors to this volume point out that such optimism is not necessarily warranted. Focusing on the business model of search engines and social networking sites, Van Couvering (Chapter 8 ) examines how the commodification of online traffic is affecting the relationship between traditional media and what she calls navigational media. Navigational media such as Google News and Facebook do not produce their own content but serve as key platforms that mediate the connection between audiences and producers. As a result, the level of participation and content diversity that audience can access is only guaranteed within the parameters of those platforms. Fuchs (Chapter 9) argues from a more radical perspective that digital networks have been subsumed by the process of commercialization and that the contemporary Internet is predominantly a corporate space for capital accumulation. For Fuchs, the myth of participatory web serves the ideological function of reinforcing exclusion and hierarchy. A second myth which is closely related to the first one is that traditional media is in crisis due to the rise of digital networks. Winseck (Introductory essay) uses longitudinal data of the global revenue of big 10 media and entertainment industries to demonstrate that every segment of the media industries has grown between 1998 and 2010. Despite early rumours on the death of television, it is thriving everywhere in the world with the logic of the industry moving from advertising driven to the pay per view model. Another example is the narrative that music industry puts forward rather successfully on how they are in a dire situation because of the rampant online piracy. Looking at the data of music industry revenues generated from sources other than selling ‘recorded music’, including concerts and live performance, internet and mobile phones and publishing, Winseck points out the ‘badly flawed’ image of a besieged industry. This kind of crisis talk often has significant impact on policy and regulation. In the case of television industry, the perceived threat could be utilized to argue for less restriction on merger and acquisition, which lead to further concentration of media ownership (Mastrini and Becerra, Chapter 2). As for music industry, evidence across the globe already suggest that policy makers have bought into the myth that online piracy caused the decline of music industry thus needs to be clamped down with repressive measures. It is only by deconstructing myths like these that we can develop a dialectic understanding of the changing mechanism of control and survival of media industries. On one hand, we need to study how power relations embedded in broader political economic contexts shape the transformation of global media industries, on the other hand, we should be aware that in the process of adapting to changes, media industries themselves are also key brokers of power that influence the dynamics of society at large. This dialectics can be seen in Arsenault’s (Chapter 4) examination of the global networks of information businesses and her emphasis on the major players’ capability to change network program and leverage new connections. It can also be seen in Christopherson’s (Chapter 5) analysis of how consolidation and financialization have altered the profit strategies of entertainment product distributors, which then affect the livelihood and wellbeing of media workforce. In fact, Davis (Chapter 11) presents evidence to argue that the very development of financialization in market economies at the global level has been supported by the financial media via its influence on elite discourses. The main limitation of the book is the ostensible western-centric, or rather, Anglo-American bias. Most of the evidence comes from media industries located in the U.S. and Canada, with only one chapter on ownership concentration in South America and one comparative analysis of policy debate in New Zealand and UK. Granted that Winseck did specify in the first page of the book that the object of analysis is the “composite of the 10 largest media and Internet industries” (p.1), most of which are indeed U.S. companies. But given his recognition that the centre of gravity is tilting “decisively toward Asia” (p. 38), one wonders why Asia did not feature more prominently in a book on the transformation of global media. Or is there an underlying assumption here that the networked feature of media industries has rendered geographic location irrelevant? This review was originally published on the LSE British Politics and Policy blog on 15th April 2012. Bingchun Meng is a Lecturer in the department of Media and Communications at the LSE. She has a BA in Chinese Language and Literature (1997) and an MA in Comparative Literature (2000) from Nanjing University, China. She obtained a PhD in Mass Communication (2006) from the Pennsylvania State University, USA. Before joining the LSE, she was a post-doc fellow at the Annenberg School for Communication, University of Pennsylvania, where she worked at the Centre for Global Communication Studies and also taught courses on Chinese media.